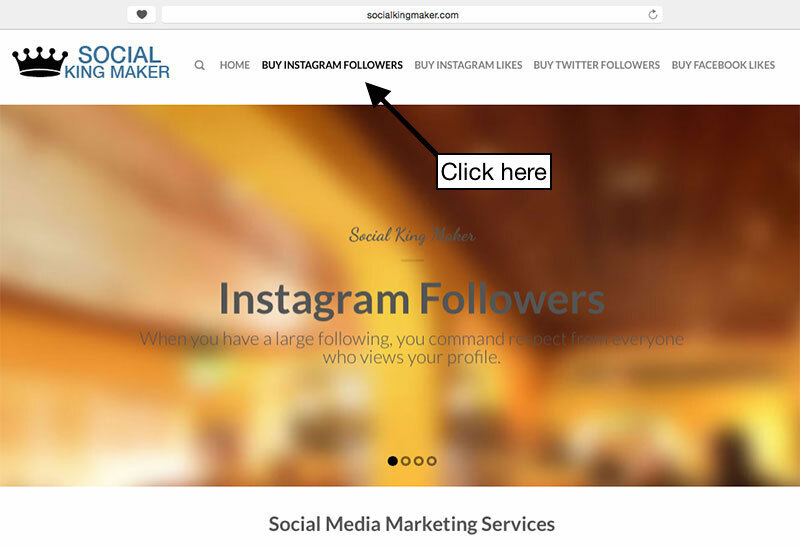 Buying Instagram followers is not a rocket science. You don’t need to understand how it works in order to benefits from it. All you need to do is to carefully select the right vendor (like us), decide what is the right amount of Instagram followers you will need. 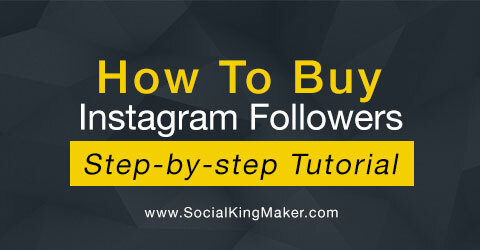 In this tutorial we will show you how you can easily buy Instagram followers from us. Don’t worry about will you buy the wrong amount of followers as you can and always welcome to buy again later. 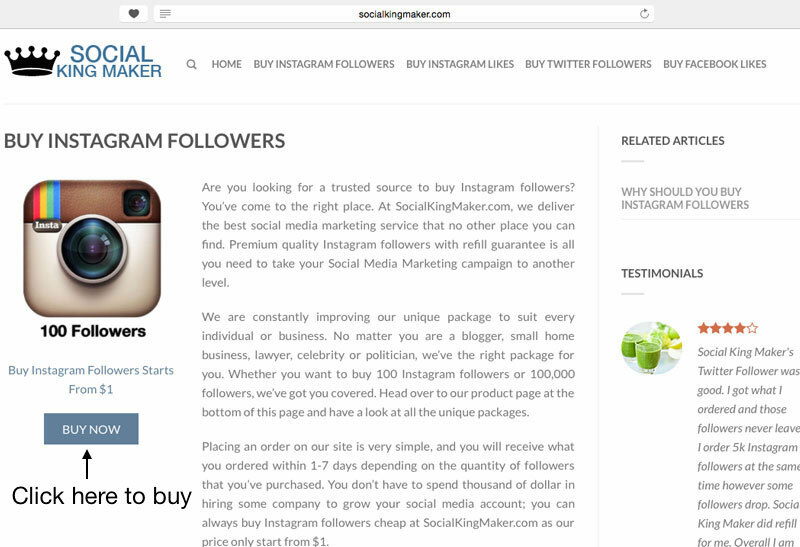 Go to http://socialkingmaker.com and click on the “Buy Instagram Followers” menu on top navigation bar. If you like you can read through the benefits of why you should buy Instagram followers, if you don’t have time, just click on the “Buy Now” button on the top left of the page. The system will send you to the check out page immediately. If you wish to add more products, just go to top menu and click on the other product where you are interested. If you wish to modify the product quantity or remove the product from shopping cart, just click on “View Cart” button on top. If that’s all you want to buy, just fill in your details and select your payment method. We accept Paypal and all major credit cards. 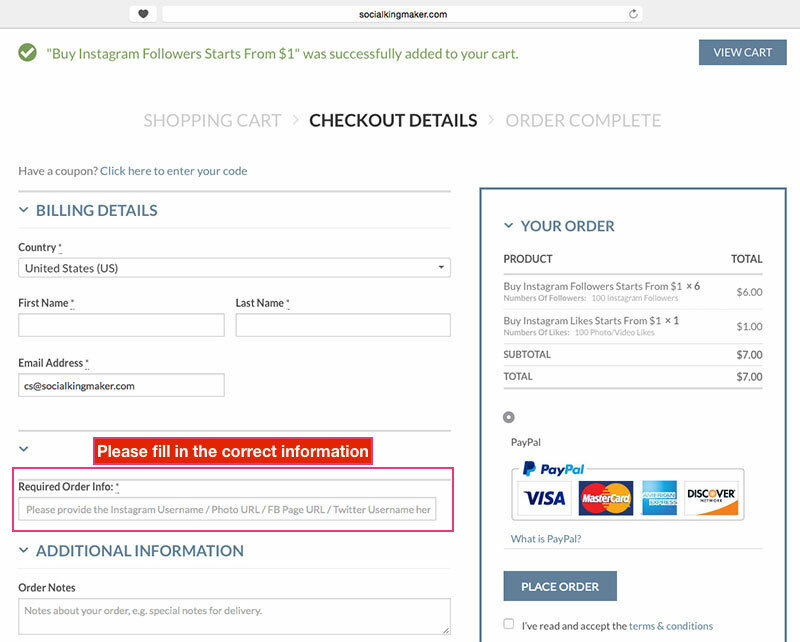 Please don’t forget to include your Instagram username or the photo URL if you had bought the Instagram Photo Likes package. Once you had follow and completed the above easy 5 steps, you will be receiving few emails from us informing you the progress of your order. Depending on the quantity of Instagram followers you purchased, we will take from 1 to 7 days to process your order. If you have any questions regarding How To Buy Instagram Followers on our website, please contact us via the “Contact Us” link located at our homepage. 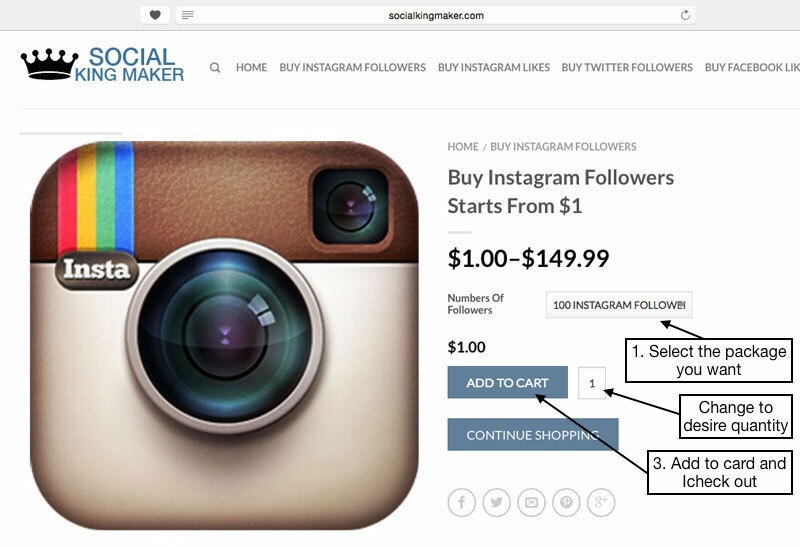 Buying Instagram followers is that easy, you can start experience our excellent service by buy 100 Instagram followers as a trial today! Social King Maker's Twitter Follower was good. I got what I ordered and those followers never leave. I order 5k Instagram followers at the same time however some followers drop. Social King Maker did refill for me. Overall I am satisfied with their service. Will order again. I ordered a trial with 100 followers, and Social King Maker delivered within an hour! I ordered 10k again and they delivered as promised too! Good job! Highly recommend! I started a new Instagram account 8 months ago, and until last two month i had only 374 followers. I ordered 25k Followers Package, and all followers delivered in 5 days. Since then, my sales keep increasing! I love their service! Thank you Social King Maker!